Shoton Festival is also known as the Yoghurt Festival. Before the 17th century, Buddhist discipline required monks to stay in their temples for weeks in the summer. This is to prevent them from stepping onto small creatures outside the temples and also to teach them to live in harmony with one another. When finally allowed to leave their confinement, monks went down the mountains where laymen would prepare yoghurt for them as alms. The monks enjoyed the yogurt and happily celebrated their newfound freedom. 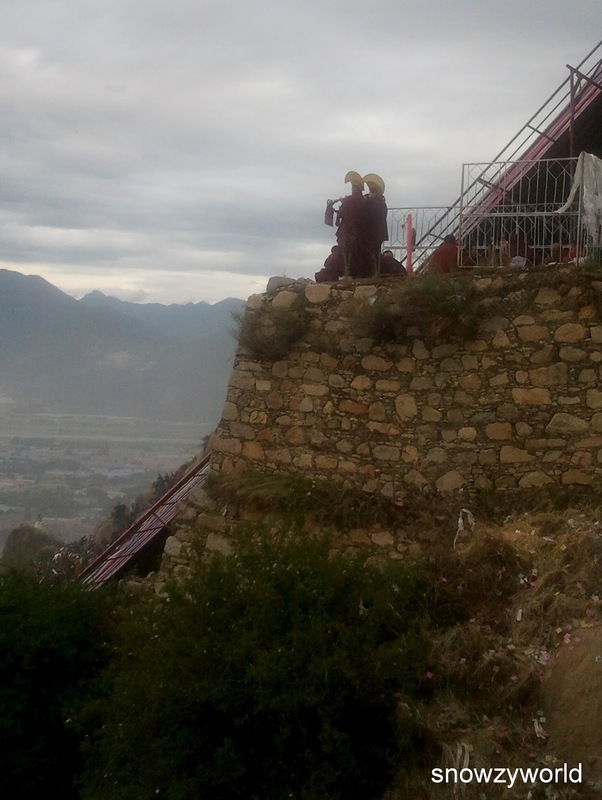 This is the origin of the Shoton Festival at Drepung, which takes place every August. Today, the Shoton Festival will begin with the dramatic unfurling of a giant thangka banner of the Buddha (Sakamuni), amidst incense smoke, the sound of bugles, and scripture recitations. People rush to it to make offerings before it is rolled up again in less than two hours. 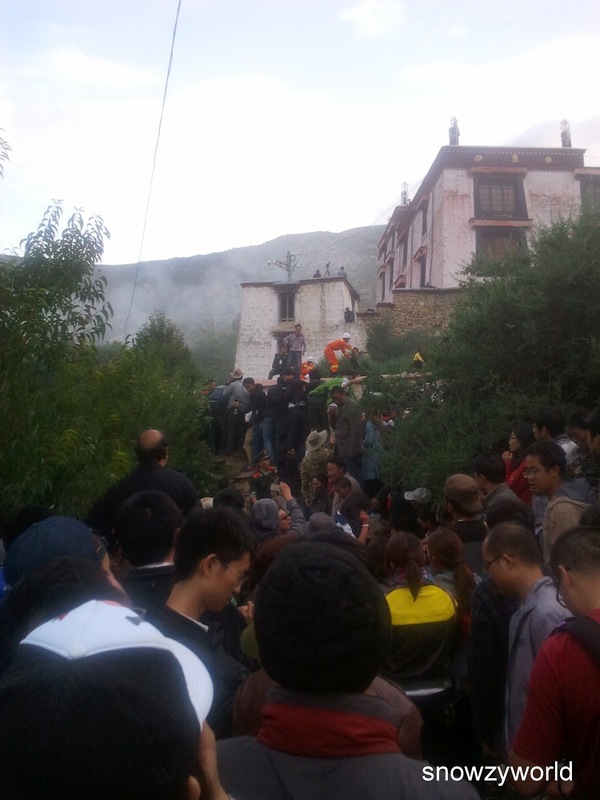 After that they will proceed to the Norbulingka for picnics and Tibetan opera performance. It happens to fall on the 2nd last day of our trip. We set off to Drepung at 5am. It’s a very big festival in Lhasa and most of the Tibetans will be there to witness the unfurling of the thangka. Our car cannot park near the monastery so we’ve to walk a far bit. The nightmare came when we got stuck somewhere before we head up the other side of the mountain. There were so many people and everybody was pushing. A few times, I almost lost my footing. Being sandwiched, I started to feel breathless. Me and Kenn later got separated from Yin and our guide and both of us got pushed out from the main crowd to the side which gave me some relieve actually. I am really scared to become a victim of over-crowding and stampeding. We saw people (even the policeman) falling off the bridge but luckily nobody was seriously hurt. Some elderly or children who almost fainted were carried away for fresh air. After waiting for sometime, I saw Yin and our guide being pushed out from the crowd too and I am so glad to be reunited with them and luckily they were unhurt! 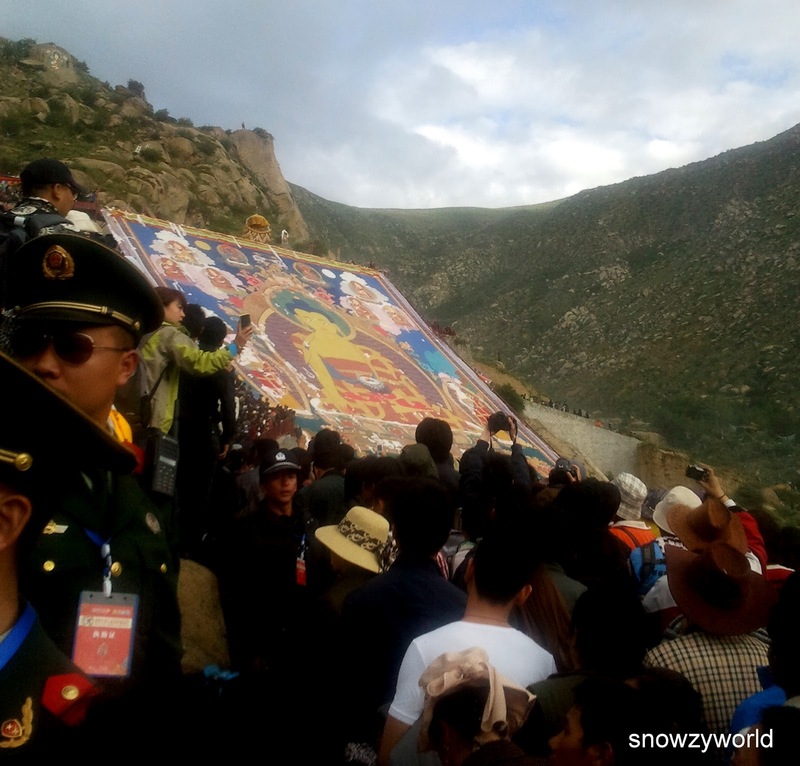 What had actually happened was that near the foot of the mountain where the thangka was, polices stopped the people from moving forward. They’ve set up a security check there requesting them to produce their ID thus causing the over-crowding and pushing. The situation started to get out of control and finally they stopped the stupid check. We decided to go via another route, trek at the edge of the mountain and do some climbing up. I am glad once again that we are quite used to such terrain so it was not that difficult for us. Finally we reached the place where we could see the thangka, of course we missed the unfurling of the thangka, but nevertheless we still pray for blessing and throw the white hada towards the thangka. We need to walk round the thangka (clockwise) towards the monastery and down the hill in order to get back down to our car waiting somewhere for us.